Tyga celebrated his 24th birthday last week, including appearances from friends, family and a subpoena. Thats right. 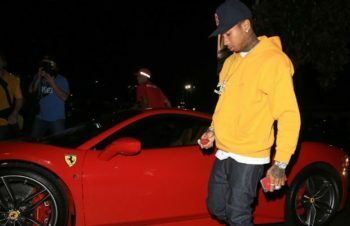 While its not clear if the subpoena he received is 100% related, Tyga has incurred yet another lawsuit for missed payments on his red Ferrari. The same red Ferrari that has already been repo’d twice. Either way you slice it, thats not a great look for Tyga. However, despite the numerous (almost regular) lawsuits involving Tyga’s missed payments with landlords and car dealers, he’s managed to escape them all without serious legal penalty. This leaves us with two questions; is Tyga making the lives of his landlords/car dealers hell because why not-lifestyle of the rich and famous-I’ll pay you only when i have to? Or has Tyga found himself a sugar mama in Kylie Jenner? After all, she did recently buy him a brand new Bentley truck. Perhaps he’s making quiet and smart investments, but at the very least we know all of this mulah didn’t come from Birdman during his time with Young Money (Hip-Hop zing). We all have a type of love for Kanye West, whether it’s that we love to hate him, or just simply love him. Kanye West is arguably one of the greatest artists of this generation. Kanye recently had a mental break down and was admitted to a Los Angeles Hospital. Kanye is currently under watch and is battling mental health issues. Kanye West has been going on rants, cancelling tours, and leaving in the middle of shows. At some point we have to stop and ask ourselves, what’s going on? Dealing with mental issue can be a difficult thing on an individual, because in most cases it’s a life and death situations. We sometimes forge that some of these entertainers are actually human beings with real feelings and emotions. We haven’t seen that with no other artist, like we have with Kanye West. Keep Kanye in your prayers as he battles his demons and hopefully overcome it and come out a better individual and stronger mentally. It has been a crazy week so far in the Hip Hop world. We received great music from YG, and The Weeknd. The west coast gangsta dropped an 8 track mixtape (that should have been an EP) with nothing but bangers called Red Friday, on Black Friday. He starts off the tape with an intro of a female saying that the trilogy to his “Just Re’d Up” series is coming soon. The tape includes a part 2 track to his and Meek Mill’s “I’m a Thug”. It had features from the verse king 21 Savage, Mr. LA aka RJ and an up and coming artist named Mitch. The Weeknds album Starboy was more than we all expected. It is a soft, soulful yet edgy sound. This catchy sound track included features from Kendrick Lamar, Daft Punk and Lana Del Rey. In other album news, Lil Wayne announced a new project titled Funeral which he assures us is on the way, and Mos Def also announced his final album titled December 99th coming our way December 9th. November has been a warm month from all this heat we’re getting. We hope we get even more in December until then go check out these new albums.